Preliminary design plan for Fiscal Year 1913 battleships. This drawing was one of four sent to the Navy’s General Board on 2 March 1911 to illustrate options of interest. 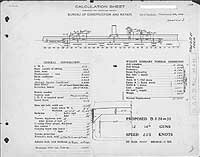 This plan shows a ship having deeper draught than Scheme "G" (see Photo # S-584-010), illustrating the benefits to overall design of a deeper hull than specified in General Board characteristics. The design was 20 feet shorter than Scheme "G", with significant weight shifted from machinery to protection to allow thicker armor. Reciprocating steam machinery gave one-half knot less speed than the turbines in Scheme "G". 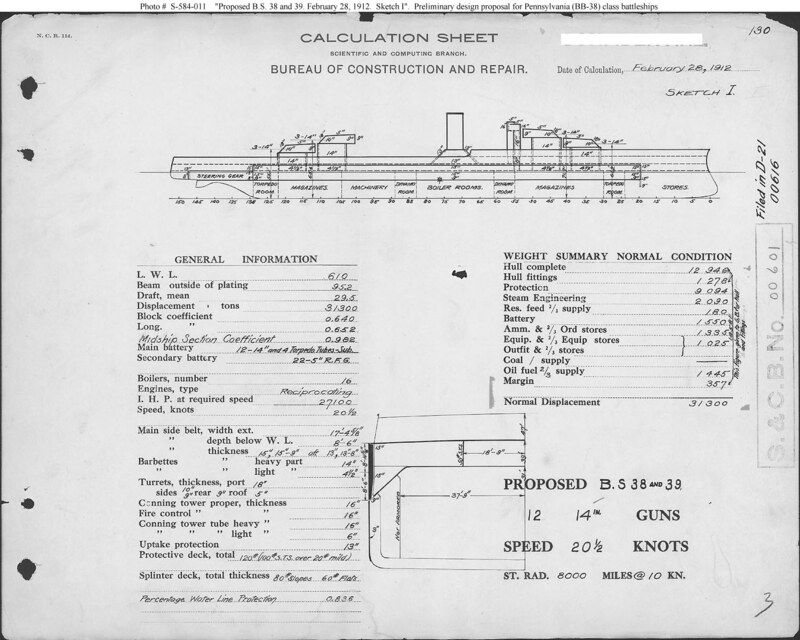 This plan provides twelve 14-inch guns, reciprocating steam machinery, and a speed of 20.5 knots in a ship 610 feet long on the load water line (L.W.L. ), 95.2 feet in beam, with a normal displacement of 31,300 tons.